Humber Valley and Newfoundland continue to provide amazing sights and memories ... 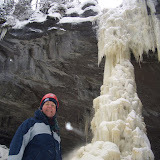 This week we joined a tour to "Snowshoe to the Sinkhole in Gros Morne". Its a 45 minute drive from Humber Valley, up past the Jack Ladder to Wiltondale, and then 10 minutes to Lomand, and snowing all the way! We're quickly out of the jeep and with snowshoes on, venture off with great purpose in to the woods. We're heading for the Sinkhole and are told its a 6km walk, aided by a snowmobile with a towed sled. The guides whizz by on the snowmobile with loads of gear, and then return to take those in the group that are not quite as fast as others. It felt all up hill, but was a good walk, and we made it to through Gros Morne National Park and to the locally known "Sinkhole". There we met Marty from My Newfoundland Adventures, who explained what was going to happen next, and then after a quick sandwich and hot chocolate, we're climbing down into the Sinkhole. The ground has eroded creating an area the size of 1-2 football pitches with 150 foot cliffs all the way round, a waterfull crashing into the middle from above, and the resulting water disappearing into a cave system. In winter the waterfall dramatically freezes up creating amazing ice sculptures. Apparrently in full winter the water is totally surrounded by the ice, and flows through the middle of the frozen pipes. The snowshoe walk was long but worthwhile. When we got to the Sinkhole, there is a particular spot where the cliff drop has given way to a climbable incline. The guides had sorted a rope system to help those that needed it - so even the more fragile in our group - made it to the bottom ... and WOW what an experience. We definately felt like the "special ones", visiting a place that so few will ever get to. The company said Dobbin’s shareholdings in the company “are unaffected and existing restrictions on the disposal of shares remain in effect.” In addition to the locally well-known Humber Valley project, Newfound has other resort projects in Nevis and St. Kitts. On Dec. 13th, two other Newfound directors provided much-needed working capital for the company. We're CrazyAboutNewfoundland.com ... Are you? Winter season has definately started at Humber Valley Resort, Western Newfoundland. Marble Mountain, the top Canadian east coast ski mountain opened on Saturday 22nd - earlier than expected. Loads of snow and seriously cold (-18 degrees on 21st Dec). The Gray's traditional "Mr Frosty" appeared on Sunday 23rd ... this year hes 7 1/2 feet high and found at 55 Mountain View - Humber Valley Resort. Jean & Malcolm went Snowshoeing across the golf course, and as well as Malcolm disappearing into a hidden bunker (taking 15 minutes to get out!!) ... They also watched a moose crossing the fairway. Snowmobiling and Dog Sledding (new to Newfoundland!) are all on the plan ... Its going to be warmer Christmas Eve and some rain - but then back to snow and freezing tempatures. players in the industry are all trying to et a stake in the vast resources our province has to offer. This naturally has the effect of better paying jobs and a willingness from consumers to buy big ticket items such as houses. A quick drive through any of the larger populated areas will no doubt surprise any visitor or former locals returning home. Houses are going up everywhere. All news reports point to the fact that there is not enough skilled trades to keep up with the demand for new housing. This is leading to increasing purchases of older homes that are move in ready and may need only minor work to convert it to be adequate accomodation. In the area of Gander, it has been said that the cost of building new homes over the past 4 years has risen by an average of 15% per year. Will the boom end anytime soon? Probably not as the current government seems intent on developing the province as a major leader in the production of oil and hydroelctric generation. The opportunity to invest is present for any savvy entrepeneur! We're www.CrazyAboutNewfoundland.com ... Are you? Further to the announcement of 4 December 2007, Newfound N.V. announces that it has raised £3.6 million (before expenses) by way of a share placing to institutional and other investors of 35,807,962 new ordinary shares. This is in addition to the £7 million subscription by Jeremy White and John Morgan, Directors of the Company, announced on 13 November 2007. The Placing Shares are being issued at 10p per share, which is the same issue price as for the Subscription. The price of 10p per share represents a discount to the closing mid-market share price on 4 December 2007 of 14.9%. Based upon the valuation undertaken by Humberts Leisure, the international leisure business consultants, announced in the Interim Results on 26 September 2007, the pro-forma NAV per share is calculated at 45p per share following the Subscription and Placing. EXPAND THE RESORT PORTFOLIO IN THE LONG TERM. As stated in the Circular to shareholders dated 13 November 2007, there are a number of opportunities in the near term for the generation of additional capital through the operations of the business. In particular, the proposed transaction to sell land at Nevis for the development of a 5 star hotel continues to progress and there are bulk land sale opportunities at both Nevis and Humber Valley that could realise significant cash for the Group. These transactions would provide the Group with a platform from which to continue to develop the resorts at Humber Valley and Nevis. The Company's success in completing some or all of these transactions will, however, inevitably be critical for the prospects of the Group over the longer term. Newfound is a creator and operator of international luxury resorts and destinations. The Company has a high quality portfolio of resort projects at Humber Valley in Canada and in Nevis and St. Kitts in the Caribbean. Humber Valley Resort, with 2,200 acres, currently has over 200 privately owned properties the majority of which are available for rent. It is an all-season, luxury resort offering golf, world-class salmon fishing, sailing, skiing and a luxury spa. Newfound has an integrated business model based on destination master-planning, which generates revenues from multiple sources, including freehold land sales, construction and development, services to owners, the provision of leisure activities and the operation of concessions. Newfound is building an industry leading, world-class luxury lifestyle brand offering exceptional holiday experiences in luxurious homes, situated in locations of outstanding natural beauty. RNS Release We're CrazyAboutNewfoundland.com ... Are you? Fun video showing some of the adventure activities happening in Humber Valley Newfoundland. Where sky, land and water embrace, outdoor enthusiasts arrive in anticipation and leave in awe. Come and experience the unexpected. As a boy I would wander along the southern shore of the Humber, watching the ferry plough across the waters from New Holland to Hull, keeping a ready eye out for the white elephant that my grandfather told me lived in the muddy banks of the river. The irony would not be lost on him now, as a white elephant did indeed eventually emerge – in the shape of Humber Bridge. And now, years later, I find myself once again wandering the banks of the Humber, but I am in a different place, a different time zone, and indeed a different world entirely. Once upon a time, the thought of a long-weekend hop to Canada would have been laughable. Economy flights and ease of access have since made that a reality. For in today's competitive global marketplace, with tourism a strategic growth factor in many a country's economy, the promotion of multi-season activity is big business. Newfoundland is a good case in point. With high levels of snow and breathtaking scenery, the west coast is an ideal place to enjoy winter attractions, including a fine network of groomed trails of snowmobilers and first rate destinations for skiers. Yet it is as a summer location that I was interested this time round. I was soon to discover that Newfoundland has so much to offer in terms of outdoor activity. So how do you get to do it all? Better ask yourself, how much time do you have? For while businesses and community groups have been working to develop new products and extend the season, the government has been busy providing funding to a number of businesses and non-profit organisations from Deer Lake to the tip of the Northern Peninsula, thus helping promote the province as a multi-choice, multi-season destination. Woven around a spectacular golf course, the award-winning Humber Valley Resort is located on the west coast of Canada's most eastern province, and is less than six hours' flying time from the UK. The Humber Valley stretches 70 kilometres from Deer Lake airport to the seaport of Corner Brook. Cutting across this idyllic terrain is the mighty Humber River and the 30 kilometre long Deer Lake. The resort is 20-minute drive from the airport along the Trans Canada Highway, offers luxurious private accommodation and holiday rentals nestling in boreal forest on the north side of the lake. The splendid wood-built chalets range from three to five bedrooms. There are currently 200 on the sprawling 2,200 acre site, with plans to potentially grow to a thousand. Each chalet is set in a secluded spot with generous pine decking areas surrounded by Canadian Spruce. There is a choice of locations to choose from, including standards. Interestingly, approximately eighty per cent of owners are from the UK and Ireland. Eagle's Perch, the resort's clubhouse, overlooks the valley and offers spectacular views of the surrounding area. This forms the heart of the resort with recreational facilities, a restaurant, bar and reception area. Lower down the hill the Beach House provides further dining opportunities and nightly entertainment, with both a casual restaurant and a pub eatery (Sully's). It also offers a splendid terrace area with direct access to the sandy beach on the lake shore, from where you can launch your kayak or canoe and follow the lower Humber River as it winds for 19 kilometres through the valley and empties into the stunning Bay of Islands. You can strike out from the resort for Newfoundland's thousands of miles of coastline, ancient mountains and glacier carved fjords, providing breathtaking contrasts and landscapes. A 90-minute drive away is Gros Morne National Park. A UNESCO World Heritage Site, Gros Morne [photos] offers more than 100 kilometres of marked hiking trails, from leisurely strolls to challenging treks through dramatic rock formations, and it is possible to summit the Gros Morne (806 metres). It is recommended to start your park visit at the Discovery Centre in Woody Point, or the Visitors Centre in Rocky Harbour, where Parks Canada guides will help you plan your tour and identify the waterfalls, marine inlets, sea-stacks and cultural activities available. Ten minutes' drive from Humber Valley Resort is Marble Mountain, which opens its lifts to skiers from mid December for four months. Within easy reach of here is Corner Brook, the second largest city in Newfoundland. Marble Mountain is also home to My Newfoundland Adventures. In the seven years since the activity company's launch, Newfoundland has witnessed &' progressive change, from being primarily a resource extractor with fishing, forestry and mining at its core, to where it sits today, its focus underpinned on an emerging tourism industry. My Newfoundland Adventures has successfully ridden on the back of that wave. Marty Hanzalek relocated to the Humber Valley from the west coast of Canada and its mature tourism industry, and was taken aback by the multitude of rivers, mountains, beach and ocean venues, very little of which had been utilised. "The opportunity was there to showcase the area to the outside world, offering outdoors enthusiasts from every age group the chance to partake in what this place has to offer," he says. "My Newfoundland Adventures received a fantastic reception. Newfoundlanders are well known for being friendly, synergistic, and helpful, and that has been tried, tested and proven in our seven years here. We would not have been able to do or be where we are without the help of the locals, who have really identified the opportunity with us." The business specialises in a mix of water-based and 'high angle' activities such as canyoning and rock climbing, as well as leading groups into the subterranean world 50ft below Corner Brook, and its spectacular cave system. 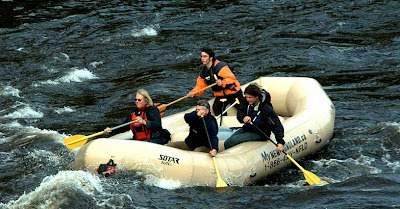 Rafting has also been a popular activity since the outset, taking place on one of the biggest Atlantic salmon producing rivers in the world. The Humber sees upwards of 70,000 salmon swimming upriver every year. Currently on offer are over 40 unique adventure activities that take place in the Humber Valley. The mandate all along has been to offer high-end accessible adventure, from beginner level, although there is room for every genre to come to Newfoundland and have a fantastic, world-class experience. "From time to time we do get experienced individuals that want to avail of a more advanced programme, and we have those in place, but 90 per cent of what we do is beginner accessible," says Marty. As a result, many enthusiasts return, either wanting to experience other activities or further their skills level at one particular pursuit. That has helped the business grow its more advanced programmes. As the accent on adrenalin sports grows worldwide, so My Newfoundland Adventures is constantly launching new product. "We can build your skills, grow with you, and with your experiences, and provide years of unique adventure activities," says Marty. "If we were not in this location, it would be very difficult to find another place in the world that would be conducive to so many different outdoor sports in one zone." Conscious of environmental stewardship and conservation, My Newfoundland Adventures primarily offers non-consumptive, self-propelled activities like dogsledding and backcountry skiing during the winter, and tries to include an educational component in everything it does. Therefore, not only does a participant leave having had a great experience, but also with a few tips or ideas to hand that would otherwise would not have been available to them. Accessibility is such a great thing. With the advent of cheaper flights, it is possible to fly from Gatwick to Deer Lake on a 'Tuesday or Friday, and enjoy a long weekend or week of fun in the sun, or in the snow. That accessibility has opened the door to the UK and mainland Europe. "In the UK, people seem to be money rich and time poor. There are those out there that would love to participate and can afford it financially, but cannot afford it time-wise," says Marty. "That has changed with the advent of cheaper flights. "We always ask our visitors why they come here, and they tell us every time, it is the things that they can do. We work hard so you now get a chance to come and play hard, and experience those things that you always dreamed about, in a wonderful environment. Come to Newfoundland, because nobody wishes they spent more time at work." The first year of WestJet’s seasonal air service drew to a close recently and the company is pleased with the operation. According to Avery, the company is still hoping to develop into the seasonal service into year round flights out of Deer Lake Regional Airport. Company CEO and president Sean Durfy said WestJet, which recently reported huge third-quarter increases in profits, is committed to increasing its fleet over the next five years. “We’re continuing to grow our Newfoundland services,” Avery said. “We’ve expanded into Deer Lake of course and our service out of St. John’s has gone year-round and we’re hoping to grow the Deer Lake service as well. “Right now, we couldn’t go year round with the service out of Deer Lake because we simply don’t have the planes we need. But Sean Durfy just announced that WestJet is committed to building our fleet of 737s to 118 by 2013. We are CrazyAboutNewfoundland.com Are you? We're CrazyAboutNewfoundland.net - Are you? This is obviously good news for the resort, and for Western Newfoundland tourism ... Full article on forbes.com and offical release on ShareCrazy.com ... though unsurprisingly the stock market reacted by lowering the share price by more than 20% to 16.5p - due to the dilution of the shares. The Loonie is crazy! ... or the crazy Loonie! The Canadian Dollar ... Do I need to say aything else? AND US dealers are now being told to NOT sell to Canadians! ... you can't buy a snowmobile in USA and export to Canada ... I've tried - "sorry, not allowed!" ... and tried, and tried! Every $0.01c costs the Corner Brook mill ... $3,000,000 per year !!!! Newsprint giant Kruger Inc. cited the high Canadian dollar Monday as it indefinitely idled some of its capacity at its newsprint mill in western Newfoundland. Kruger said in a statement it is shutting down one of the machines at subsidiary Corner Brook Pulp and Paper. Kruger Inc. will indefinitely close one of its machines at Corner Brook Pulp and Paper in November. (CBC) The machine, the smallest of four at the Corner Brook mill, produces about 80,000 tonnes of newsprint each year. "The company regrets having to make such a decision. Unfortunately, the high value of the Canadian dollar leaves us with no other choice," senior vice-president Daniel Archambault said in a statement. The release says ... "Luxury resorts operator Newfound NV said it has not been able to secure a 21 mln usd loan facility to provide working capital for the development of its Humber Valley Resort. Consequently, the company said it is proposing a subscription of new shares by directors at a significant discount to market price to raise 5 mln stg to secure its financing requirements for the near term." We're CrazyAboutNewfoundland.com - Are you? We are CrazyAboutNewfoundland.com ... Are you? A new adventure (& fun!) attraction is to open next year in Western Newfoundland, at the base of Marble Mountain. It is "Marble Zip Tours" and located close to the "My Newfoundland Adventures" kiosk. 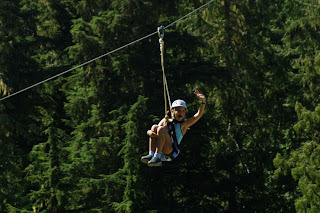 The tour includes six zip lines across Marble Mountain Gorge directly above Steady Brook Falls! 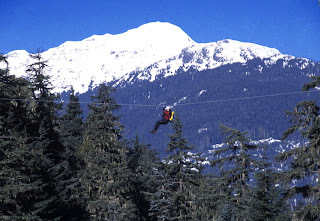 And using their words ... "Feel the adrenaline pump through your veins as you zig zag down the gorge soaring from platform to platform along zip lines up to 800′ long and 300′ high, at speeds up to 80 km/hr". Bay of Islands rescue excerise becomes real emergency! An elaborate search and rescue exercise off the west coast of Newfoundland was transformed into a heart-thumping reality Thursday when passengers aboard a covered lifeboat started choking on acrid fumes, apparently from a sputtering engine. Two people, apparently suffering from serious injuries, were plucked from the motorized boat by a Cormorant rescue helicopter around noon. The 23 others aboard were taken to shore, where all but two received care from paramedics. The exercise, dubbed Ocean Guardian III, involved about 400 people dealing with a mock disaster staged aboard the Marine Atlantic passenger ferry MV Leif Ericson in the Bay of Islands, about 90 kilometres from Corner Brook. The main scenario involved an explosion and fire aboard the ferry, requiring rapid evacuation of numerous casualties. Witnesses said one of the lifeboats used to evacuate 160 people aboard the ferry started to spew smoke as it left the side of the larger vessel. Humber Valley Resort owner, Newfound NV said it slipped to a first half pretax loss of US$7.4M from a profit of US$1.8M last year after higher administrative costs. Also, the company said plot sales in the first half were negligible as the early part of the year is 'not conducive' to sales at Humber Valley, adding it had to reorganise to target high net worth individuals looking for luxurious second homes. The company's revenue for the first half to end-June rose to US$17M from US$9.6M last year, due to the increased construction activity in Humber Valley compared to the same time last year. Meanwhile, Newfound said Humberts Leisure, the international leisure business consultants, valued its resorts in Humber Valley and Nevis at US$227M, resulting in a net asset value of 77 pence a share. The company said it is in the process of finalising a loan facility of US$21M for its Humber Valley resort to provide working capital for development and for the company. We met Marty of MyNewfoundland.ca today, and he encouraged us to try the river rafting sunset trip ... for which we were easily convinced and signed up for ... The trip leaves just west of Marble Mountain, and it was a pleasant surprise to find a picnic basket, cheese platter, and two bottles of champagne in an ice bucket! (Though it was shared across the whole crew!) Its about an hour and a half to two hour sedate cruise down to the edge of Corner Brook - then again the duration and sedateness can change depending on your athletic abilities or wants that day... lets just say, ours was sedate! We're http://www.crazyaboutnewfoundland.com/ ... are you? The Humber Valley Resort’s scenic River Course has been awarded "Canada’s Best New Course of 2007" by ScoreGolf Magazine. The 18-hole, par 72 championship course, which opened in 2006, offers spectacular views from all holes including the panoramic backdrop of western Newfoundland’s mighty Humber River and the breathtaking Humber Valley mountains. 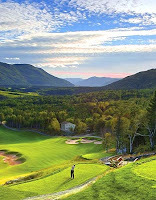 The River Course, located in the Humber Valley, Newfoundland, was designed by renowned Canadian architect, Doug Carrick and is an outstanding feature at Newfoundland’s Humber Valley Resort. "Doug Carrick designed the River Course to be a great play for both experienced and novice players. It is the kind of course that you want to come back and play again," says Brian Dobbin, Newfound Resorts Chief Executive Officer. The River Course was selected as the Best New Course in Canada by an esteemed cross section of Canada’s finest experts in golf. "We are honoured to have been named the Best New Course in Canada by ScoreGolf," says Dobbin. "ScoreGolf is a very prestigious Canadian golf publication and it means a great deal that editors and rankers feel that our River Course deserves to be rated the top new course in Canada this year," adds Dobbin. Referred to as one of the best holes in the country, the 10th hole is the most rewarding and challenging of the course. "The most spectacular course to open in Canada in recent memory…Worth heading to for the 10th hole alone" says one ScoreGolf Panelist. While the 10th hole is the most notable for its degree of difficulty the rest of the course provides its own unique challenges for golfers. "Newfoundland golf is unique in many respects" says Jamie Digby, Director of Golf for The River Course. "We have the perfect formula for an award-winning course with a Carrick design, extraordinary location and a devoted golf team. We strive to exceed our guest’s expectations on every round." We are www.CrazyAboutNewfoundland.com - Are you? Saturday we (now only Dan & Kate, as Anne went home last week) borrowed a quad bike and drove back to the resort - and then off to the east, through the brook where the bridge is out and then on a further 6 miles. The trail runs along the north shore of Deer Lake, and we end up opposite Pynns Brook (on the south side), at Bettylou and John's excellent cabin. It was our first visit to their cabin - and for sure they win the prize (so far) for cabins we've visited. Truely a home-from-home feeling. Tea, muffins and a good chat, ranging from the ways of cooking "hard bread", to describing what a real curry is all about, to logging history in the Deer Lake area ... A great way to spend a morning - Thanks guys! A screech-in night at the Beach House. We teamed up with Scottie (in white cap) and Kerri, and Brad (red cap). Scottie works as a golf-green-keeper, Kerri at the Beach House, and Brad is Assistant Golf Pro, to James who is also Scottie's good mate, and the reason hes here). It happens to be Brad's birthday, as well as his turn to be screeched ... another good night - followed by a slow day! Paul Shelley (the former provinsional minister of tourism, and now General Manager at the resort) was also at the Beach House tonight - theres more to him than meets the eye, including being rather good on stage with a guitar and microphone! Newfoundland - in the top 10 future destinations!! The Wall St Journal have a team of "International Travel Scouts", working on naming destinations destinted to become a hit with international travellers in coming years. Saadiyat Island came first this year. However in a list of others in the top ten came (in no particular order) ... Honduras, Providence Rhode Island, Montenegro, Rwanda, the Seychelles, Almaty in Kazakhstan, China’s Hainan Island, Boracay in the Philippines ... and (you guessed it) NEWFOUNDLAND !! 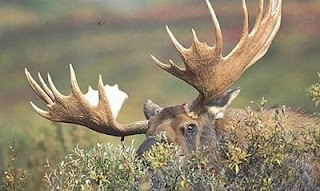 The Newfoundland moose and caribou hunting season opens today. Everyone we're been talking to is focused on, and preparing for bagging their moose! This year there are 26k moose licences, and 3k for caribou, which reflects the need to protect the caribou numbers on the island, and is a total of (approx) 2k less licences than last year. Environment and Conservation Minister Clyde Jackman said, "If you look at it nationally, woodland caribou hunts are disappearing. Our officials and our stats are still saying that we have enough caribou on this island to have a sustainable hunt. It is something we have to monitor. It’s the emblem of our province." Gold, our confidence in ourselves. Thirty years after joining the rest of Canada, the official flag still remained the Union Jack. England's official flag. It remained the Union Jack because Canada was a common wealth country of England. In 1979 however, a commission was formed to select a new flag. One year later, one of six designs submitted by Newfie Christopher Pratt was chosen as the new provincial flag, and it was first flown on that years Discovery Day. Visit & Blog - 7th Sept - Last Day, Fishing, and some! My finally day of my first visit to Newfoundland. Its the first, as I've already planned to return - which is a surprise to those that know me, as I don't normally "do" holidays as such. Anyway, so we're up early to get across to Cox's Cove as early as possible. Problem is, after last night's screech-in activites, none of us had set the alarm, so we ake slightly later - and arrive at Cox's Cove by 8am. Darrens already down with his boat waiting for us, and we're quickly all in to his Dory and off. I used to fish with my father many years ago, so was keen to show Dan & Kate that I still could. Its not long before I get my first mackeral, though alarmingly the rod did at first bend what seemed like right under the dory. Darren had taken us to a small cove about 30 minutes from Cox's Cove, and we were about 200m off shore, with a waterfall pouring out from quite a height on a cliff down to the beach below. We spot (another !!) bald eagle soaring across the cove, and then when it lands on the cliff, we motor closer to it - and wachted as an osprey repeatedly seemed to try to scare the eagle and was buzzing him - its all quite an experience! We caught quite a few mackeral, and started releasing those we considered too small. Then Dan shouted out that he had something special ... and up came a spiky red fish called an Ocean Perch, much to our joint excitment. And amazingly he followed that with a 2lb cod fish - and looked very pleased with himself!! "oh my god" was his first words, "you've got something here, Kate" ... and then as it surfaced "holy sh#t" ... repeatedly and intersperced with "unbelieveable". A HUGE fish, which turned out to be a 35lb cod ... you don't see many of those! The ocean perach and both cod had to be returned as they're out of season for non-commercial fisherman until the end of Sept.
Darren said it was the biggest he'd seen this year ... and on a mackeral line too! It was an amazing end to a perfect morning ... we had stop after, as anything else caught would simply be a disappointment! Back on the dry land, Darren quickly filleted the mackeral, and we warmed up with some hot chocolate. Later we went down to Darren's land to see the work he had completed near the stream, and to eat some berries ... A wonderful morning. Back at the chalet we cooked the mackeral and had a calm afternoon, packed, (though being an extreme light traveller that doesn't take me long) ... and go explore the inside of Dan & Kate's cabins .. charming, if a bit rough, and then down to the airport. The flight arrived early and so was able to get away early (doesn't happen like that in London!!) ... no drama getting home - easy and quick. I've had truely wonderful time in Newfoundland. The area beautiful, but the people are special. I'm definately coming back! Day 8 - Fishing & the 35lb cod !!! So we end up on my last night at the resort's "Beach House" for what they call the "screech in" ... a ceremony to create honorary Newfoundlanders, that turns out to include proving you can speak like a Newfie, drink like a Newfie, and be knighted (with an oar instead of a sword of course!) ... and then worship the fish, by kissing one! Its a good night - and everyones enjoying themselves. Though it looks like the resort cooked all the fish - as we ended up kissing a fillet of salmon!! I'm told its normally a sizable whole cod or salmon - but they couldn't find one - Shame, anyway, I'm now an "honorary Newfie" ... and proud of it!